This particular oil painting was inspired from an antique tilted bergère chair with a lovely bouquet of flowers laid down on the chair. The lighting and shadows are exceptional in this painting. The fresh and bright colored flowers bring out the youth this chair once had. The canvas is stretched and ready for your own framing. The canvas size is: 18 inches x 24 inches. 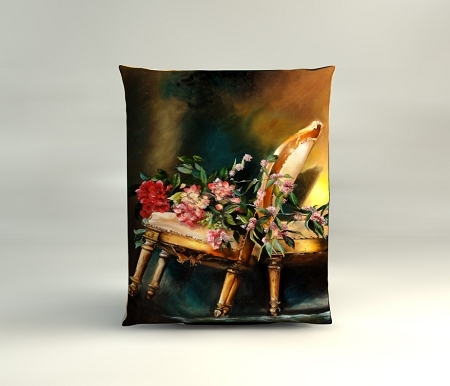 Optional Pillow Set: The images are printed on pillows made of imported Belgian linen. The fabric is doubled with an inner lining and closes with an invisible zipper. The pillow is filled with down feathers. These particular pillows measure 17.5 inches x 22.5 inches each.